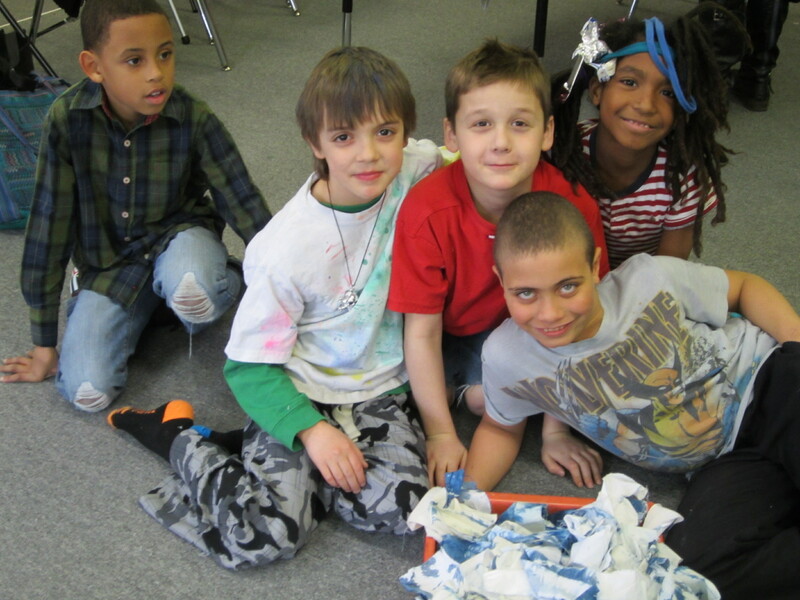 Students met with Ms. Paul and Ms. Housh for an after school session for Project Peace this week. Our first task together was to decide on a statement that each student will commit to when they sign our name scroll for the project. 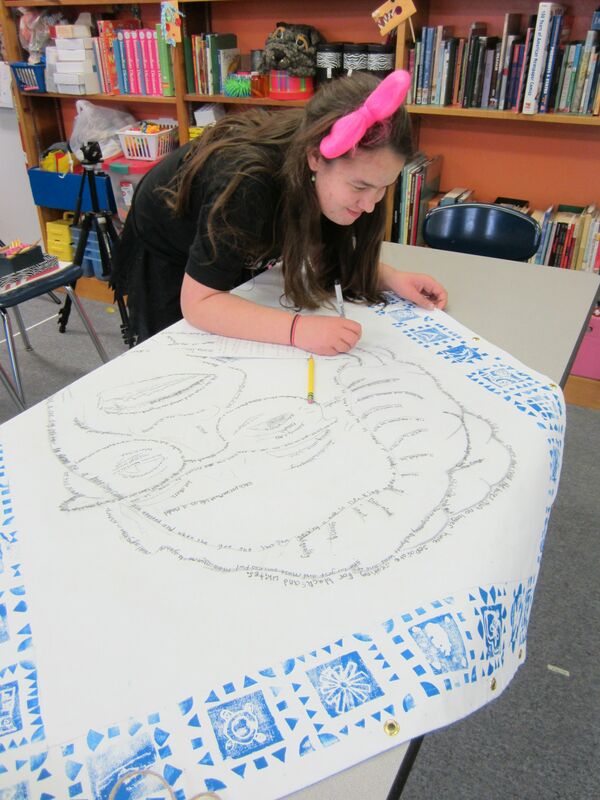 A large canvas with each student’s name in the whole school will be hung next to the three hero/peacemaker portraits. After watching Ms. Bennet’s Kindergarten Class sing their “No More Bullies” Rap, we discussed ways that we could show our commitment to acting as peacemakers. After discussing several options, students agreed that the simple statement “We are peacemakers” would be best. 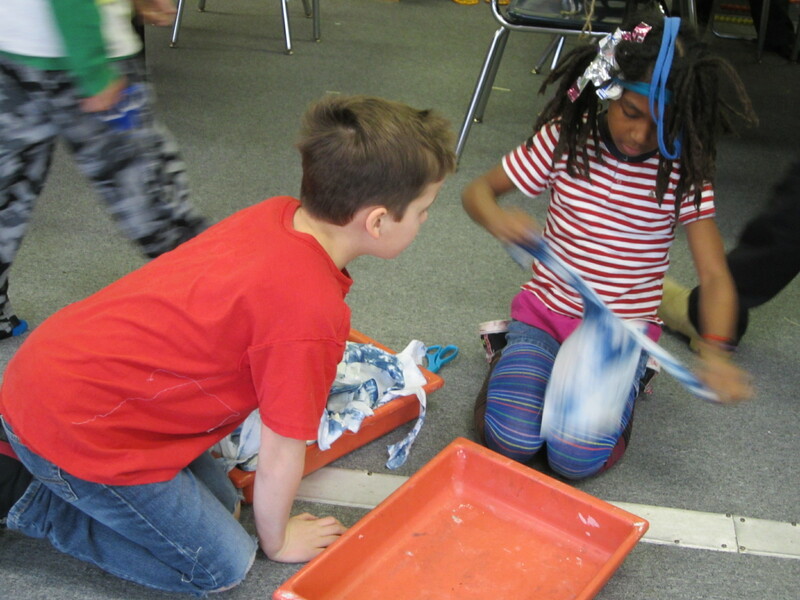 Students spent time tearing larger pieces of indigo fabric dyed by sixth grade students into strips to tie onto the outer bamboo frame around each hero/peacemaker portrait. As we worked together to tie the fabric strips to the bamboo frame, students read each message of peace aloud and we stopped to reflect on our own experiences with bullying behavior and making choices to be upstanders. Because the fabric strips are tied to the canvas and the entire message cannot be read, students’ agreed that in reading the messages we were sending them out one more time to the school community and beyond. Our hope is that we all make choices each day to be peacemakers. Students also worked to finish writing quotations and facts about heroes over contour lines on each canvas. 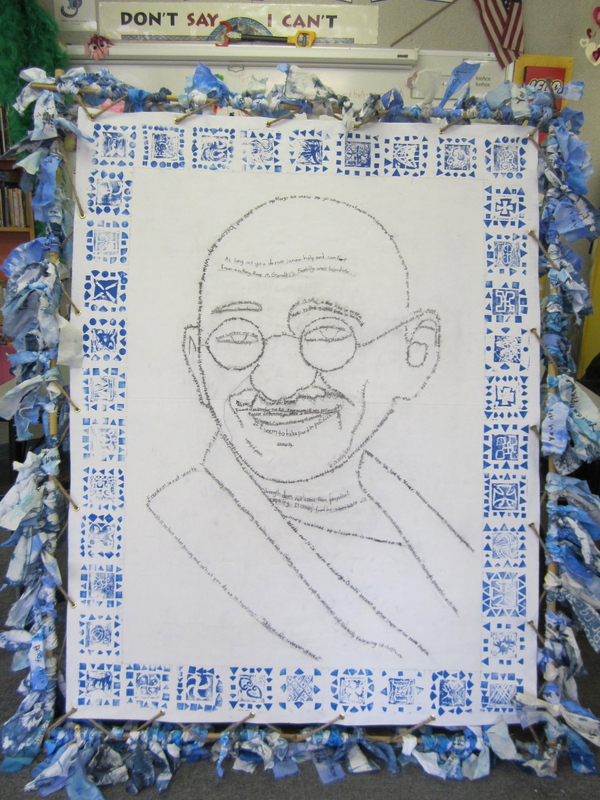 As you can see from the portrait of Gandhi, the students’ hard work is paying off and resulting in some beautiful and inspiring art! Later this week, we’ll continue adding to each canvas by stitching, beading, and painting a skin tone wash over each portrait. We’ll be ready soon for the unveiling of the hero/peacemaker portraits next week!